1.Reliable mechanical travel and vibration performance. 2.Scraper and sprinkling devices on all drums. 4.This 3-4.5ton hydraulic vibratory roller is designed with high-efficient hydraulic vibration mode. 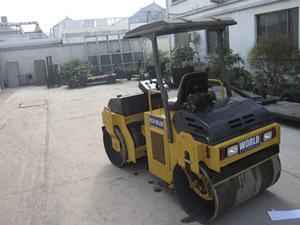 World Equipment is a professional manufacturer and supplier of hydraulic vibratory roller in China. We offer 3 ton hydraulic roller, 3.5 ton hydraulic roller and 4 ton hydraulic roller for your choice. Our products have been well received in Europe, South America, Middle East, Southeast Asia and Africa, etc. Over the past 10 years, we have kept improving our products to make them better adapt to the market. If you need hydraulic vibratory roller, we will provide a competitive price for you. Don't hesitate, please contact us.